More than twenty years ago, Carola Dunn introduced to the world the charming, vivacious and perspicacious Daisy Dalrymple and the tumultuous decade of the 1920s, in an England barely starting to recover from World War I and now undergoing rapid social changes. A series with all the charm of the classic golden age mysteries with the kind of full-blooded, three dimensional characters that define the best of modern mystery, the Daisy Dalrymple mysteries have been a favorite for more than two decades. Now, with this reissue, readers can enjoy it from the very beginning. 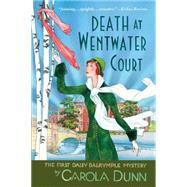 CAROLA DUNN is the author of many previous mysteries featuring Daisy Dalrymple, most recently Heirs of the Body, as well as numerous historical novels. Born and raised in England, she lives in Eugene, Oregon.